The Ward of Akavir is a priceless artifact treasured by the Imperial Legion. 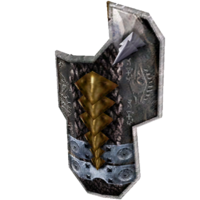 It is a tower shield with an Imperial Dragonscale design, made from the actual skin of a dragon. It bears a powerful enchantment which makes the wielder far luckier. Its origins are unknown, but its name implies that the artifact is related to the continent of Akavir in some way. The shield was originally possessed by the Imperial Legion. It was stored within Fort Firemoth, an Imperial outpost located in the Inner Sea of Morrowind. Some time in the Third Era, an undead skeleton army led by the lich Grurn marched out of the sea and overran the fort, leaving few survivors. To the Legion's shame, the Ward of Akavir was lost. Grurn claimed it for himself and took it deep underground, to a Velothi tomb located below the fort. In 3E 427, a Knight Errant of the Legion named Sellus Gravius hired a band of adventurers to sail to Firemoth, infiltrate the ruined fort, slay Grurn and recover the shield. However, it's unknown if the artifact was ever returned to Gravius. The Warlock's Ring is an artifact originally owned by the Arch Mage Syrabane, an Aldmeri god-ancestor. In appearance, it is a ring with a large gemstone, either red or green in color. It is best known for its ability to reflect spells cast at its wearer and to fortify the wearer's speed and health, though it may have additional powers. These magical effects are sometimes named "Shalidor's Mirror" and "Feet of Notorgo". It is not necessary to wear the ring to benefit from its magic. In the late First Era, Syrabane judiciously used the ring to save many from the Thrassian Plague. Because of this, he is attributed with helping to save the entire continent of Tamriel. The ring has passed hands many times, helping adventurers to reach their goals. No one may possess the ring for long, as it is said that the ring is Syrabane's alone to command. 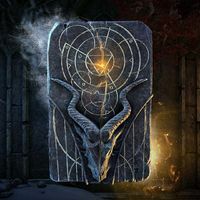 The Warlock's Ring was uncovered by the Eternal Champion during the Imperial Simulacrum in either Morrowind or Elsweyr (reports vary). Sometime in the Third Era, a fake copy of the ring appeared in the Iliac Bay before the events of the Warp in the West; it was created by a mage in an attempt to bribe an agent of Nocturnal who had been sent to assassinate him. The fake ring functioned identically to the true artifact, but after several days it crumbled to dust. The ring later came into the possession of Lady Brisienna Magnessen, a Blades operative. Brisienna offered the ring as payment in return for the Totem of Tiber Septim, which would give the Empire control of Numidium. Due to the Warp in the West, it is unknown what became of the ring. The ring resurfaced several years later in the possession of Vindamea Drethan, a powerful sorceress who lived in a cave on an island off the shore of Vvardenfell, along Azura's Coast. News of this reached the Mages Guild, and in 3E 427 Drethan was killed by the Nerevarine, who then claimed the ring. Later that year, the Nerevarine sold the ring to Torasa Aram, who put it on display in her Museum of Artifacts in Mournhold. In 3E 429, a guild of rogue mages from Skyrim journeyed to Morrowind to obtain the Warlock's Ring. It was brought to their headquarters at Myrwatch and stored there, to be held for use in the coming "great war" foreseen by their augurs. The guild intended to assemble a great number of legendary artifacts in preparation for this conflict, but failed to obtain any others. It transpired that this great war was in fact the Oblivion Crisis of 3E 433, which the mages were ill-prepared to face. It is unknown what became of the guild, but the tower of Myrwatch was ultimately abandoned and the mages who built it faded from memory. When the tower was eventually unsealed in 4E 201, the Warlock's Ring was nowhere to be found. The White Phial is a legendary bottle forged in the days when Skyrim was just starting to turn to ice. The small container was made of the magically infused snow that first fell on the Throat of the World, and possesses amazing alchemical properties. It is said that the Phial will replenish whatever fluid is placed inside of it. It was made by the master alchemist Curalmil in ancient times, and the Phial was buried with him. 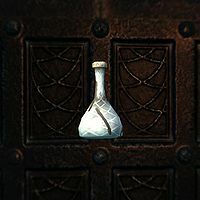 In 4E 201, after a lifetime of searching all across Tamriel, the Altmer alchemist Nurelion finally located the Phial and had it retrieved, only to find that it had been broken. His apprentice managed to repair the Phial, just before his master's death. 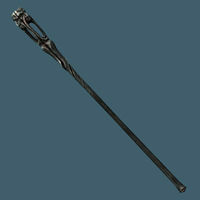 It was last seen in the possession of the Last Dragonborn. 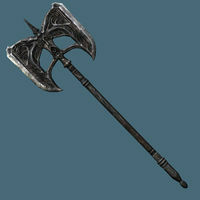 Wuuthrad, meaning "Storm's Tears" in the language of Atmora, was the legendary battleaxe wielded by Ysgramor during his conquest of Skyrim in the late Merethic Era. With Wuuthrad in his hands, Ysgramor and his Five Hundred Companions slaughtered an untold number of elves, which culminated in the founding of the First Empire of the Nords. 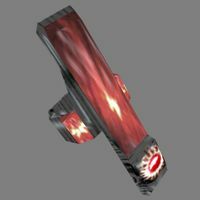 For the Companions, Wuuthrad is a sacred relic which holds a great deal of respect and reverence, and through it they can trace their line straight back to the first Harbinger.